Einkorn is one of the up-and-coming grains in the health food world, even though it’s one of the oldest grains out there. I first learned about it last year and was real intrigued by it. Because it’s so old and not very well known now, it’s very pure. It hasn’t been tampered with genetically or used to make other kinds of wheat. Einkorn’s purity means you get the maximum amount of minerals, protein, and fiber this grain has to offer. All pluses to me. Einkorn can also be ground into flour and used in sweet applications too! My friends at Food Loves Writing are the place for those. 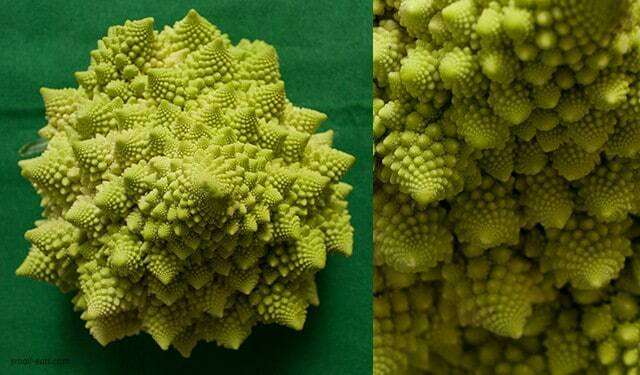 Romanesco is also something newer to me. I first got one in a CSA two winters ago and was blown away by it. Edible fractals! I roasted it and fell in love with deep and complex flavor. And, let’s be honest, how cool it looks. Combining just these two deep cuts tastes hearty and wonderful all on it’s own, but my little Greens cheerleader advised me on adding more greens and making it a great salad. In a bowl, add the uncooked einkorn berries. Cover with enough water to leave about an inch or so over the berries and soak overnight. Once the berries are soaked, bring 1 cup of salted water to a boil and add berries. Simmer for 25-30 minutes, until al dente. Drain any excess water. Turning the head of romanesco upside down, remove leaves and cut out the core much like coring a head of lettuce. Take out as much of the center and stems as you can and separate larger florets into smaller ones. Place florets on baking sheet and drizzle with olive oil and sprinkle salt and pepper over them. Roast for 15-20 minutes, until fork tender. 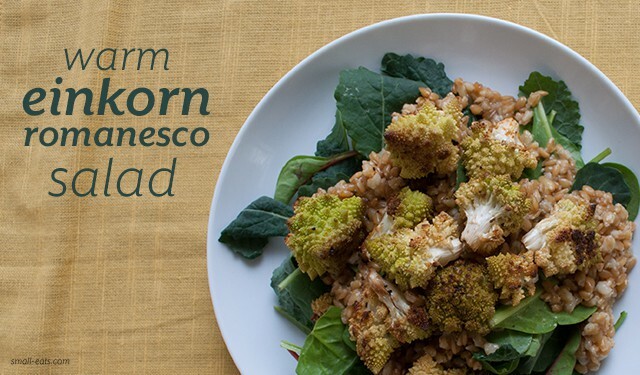 In a bowl, combine einkorn and romanesco and add any salt to taste. To serve, put handful of greens on plate or bowl. Then top with warm einkorn and romanesco mixture.